With all the hype about the biggest football transaction of the year that never materialized, and United's Champion's League title, many people have put Lionel Messi on a second level and Cristiano Ronaldo on the throne by himself. True, Ronaldo won both the European Cup and the Premier League title convincingly while Barcelona ended the year with only disappointment, but that doesn't change the fact that Messi is just a better player than Ronaldo. 1) Messi is and has always been more of a team player than the Portuguese star. Ronaldo has received heat about his selfish play and while it is true that Diego Maradona called Messi a bit selfish in the last few weeks, the Argentinian does not reach the ridiculous levels Ronaldo can sometimes achieve. 2) Age at this point in the two superstars' careers is a very underrated factor. Messi is two years younger than Ronaldo. Usually this is not a considerable difference, but compare Ronaldo from two years ago to today, and you will definitely see a difference. Additionally, the maturity level of a 21-year-old player to a 23-year-old is significant. For proof of this look at Ronaldinho, who didn't really reach his peak until he was about 25. 3) To most fans the integrity of the game is a big topic. Diving always takes away from the honesty and beauty of football, and unfortunately, Cristiano Ronaldo has perfected the art of diving as much as Olympic gold medalist Matthew Mitcham. Messi, on the other hand, is a warrior. His small frame seems easy to take down. However, it appears like he always runs between someone's legs or stays on his knees to keep a play going instead of splashing onto what some dream to be a huge green swimming pool. Another point for the Argentine. 4) Success with the national team is always key, especially when one speaks of Argentina or Portugal, and this is where Messi has the largest advantage. At only 21, the South American prodigy has won an U-20 World Cup, an Olympic gold medal, and has reached a Copa America final. Ronaldo, at 23, has been to one Euro final as the host, and that was four years ago, when Figo was still king in Portugal. It just always seems like Ronaldo ends up owing Portuguese fans a little more, while Messi, at his very young age, has given them plenty to gloat about. 5) Attitude is the single most important attribute in sports. Messi has it all. The way he takes punishment and keeps going and his never-say-die mentality are admirable. 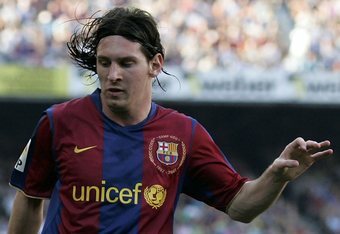 You will never see Lionel Messi on the ground unless really injured, or with his head down before the end of a game, or even jogging if there is any remote chance of getting to a ball that's seemingly unreachable. Now take a look at Ronaldo. While his talent and potential are unreal, we see images too often of him crying, arguing, or just throwing tantrums that take away from his abilities and his team's chemistry. Diving and attitude go hand in hand, which is why it is normal to see Ronaldo on the floor for several minutes, and almost impossible to see Messi in the same situation. All in all, I think Messi deserves to be put at a higher level than Ronaldo.